Scatter is a simple game. Just tap the screen with your finger. That is the easy part. It is much harder to get the timing and placement of that tap so that you recover all the scattered balls. Each ball as a fixed amount of time it will remain on the screen after it has been hit. Then it will shrink away never to be seen again. To win, you have to complete all of the levels. There are two ways to play: Chaos and Puzzle modes. 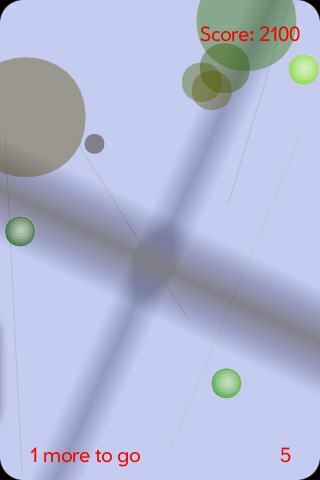 Chaos lets most everything run free and you need to capture most of the balls on the screen to complete each level. Puzzle is much more controlled and you will need to figure out just the right place and time to tap to recover the other balls. Each level has a fixed score you will receive for completing the level. In addition for every ball you recover beyond the required number, you will get a bonus of 100 points. That is the good news. The bad news is that if you fail to complete the level, you will lose 100 points. Your final score comes from all of the level scores, bonus scores and failed attempts you make at each level. Thanks to everyone that gives feedback it really has improved the game. Keep giving me comments please.